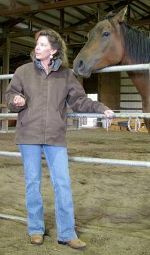 Leigh Shambo, MSW, LPCC draws upon a lifetime of experience and extensive know ledge as a psychotherapist, horsewoman/trainer, educator and spiritual teacher for her articles. She blends a clear, groundbreaking theoretical base with heart grabbing real life examples in an easy to follow and captivating writing style. All articles have previously been published in the e-magazine Equus Spirit. Fit to be Tied, or Fit to be Free? Editors and Publishers: These articles are available to be published in your print or online publication upon receipt of permission from Leigh Shambo, MSW, LPCC. You must include the bio/resource box and all contact information listed at the bottom of the article and a ‘hot’ link to this website – www.humanequinealliance.com.